Good morning and welcome to our last Daily FX Report for this week. As expected the ECB didn’t change its key interest rate though Trichet’s comment afterwards was very interesting as he said how important a “strong” USD for Europe is. Anyway, we wish you a nice weekend. The EUR/USD strengthened on Thursday to 1.5141 at its highest level after the European Central Bank announced its decision to end long-term emergency loans and tighten terms of its final 12-month tender will give greater traction to any rate increases in 2010. Having the President of the ECB Trichet said it’s “important” for Europe that the U.S. has a strong USD the currency pair rebounded to 1.5061 and added “it is clear that Fed Chairman Ben Bernanke and U.S. Treasury Secretary Timothy Geithner favor a strong USD” as well. Nevertheless the ECB kept its key interest at a record low of 100bps for now. During the Asia session the JPY rose versus the EUR for the first time this week as signs that the economic recovery is slowing damped demand for higher yielding currencies. In the early Tokyo trading hours the AUD/USD as well as the NZD/USD was only little changed on concern a report may show today that the U.S. unemployment rate rose in November after an unexpected drop in the ISM index for non-manufacturing businesses to 48.7. The CAD is headed for a gain this week of 0.6% on higher prices in crude oil, the nation’s biggest export. After the currency pair jumped at the end of October it traded in a trendless market on the same high level in November and tested at least its support at the second Fibonacci fan several times. We can see that the Bollinger Bands are contracting like a bottleneck what could be a signal for an upcoming new trend and in consideration of the declining Momentum indicator the bears may take control if the Fibonacci support will be lost. EUR/AUDThe EUR/AUD traded in a zigzag movement during the last four weeks and reached its lowest level in the middle of November. After this the currency pair recovered and rose near its resistance at the 76.4% Fibonacci retracement line for the third time. But the falling Momentum may suggest that the EUR could fail to cross the resistance again. 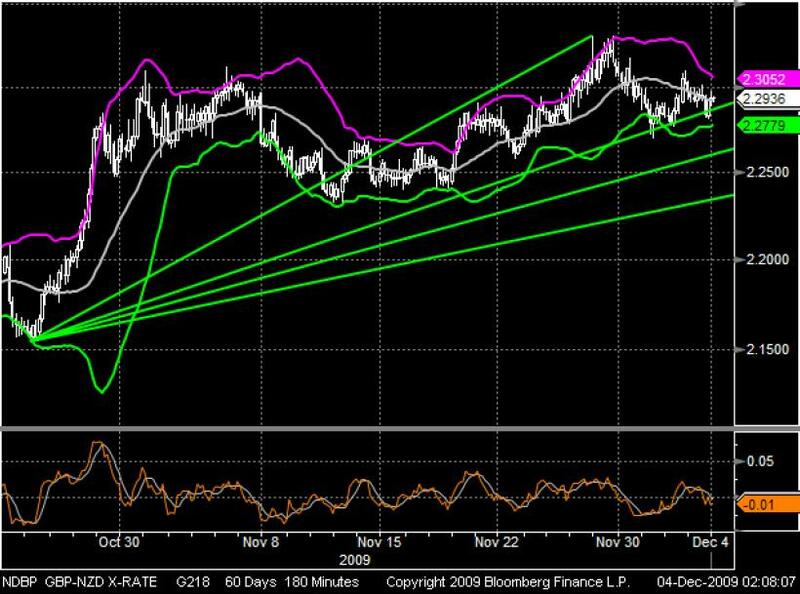 Only if the 76.4% line would be crossed the EUR may activate bullish potential.